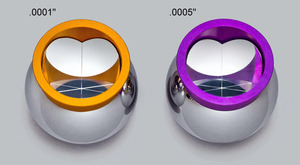 Metrology - Laser Tracking | PLX Inc.
PLX Ball Mounted Hollow Retroreflectors. PLX Ball Mounted Hollow Retroreflectors™ (BMRs) are used as targets for laser trackers and are the most accurate in the industry. PLX offers both stainless steel and ceramic Ball BMR's. Our new Durable Ball Mounted Hollow Retroreflectors (DBMRs) offer increased durability and are designed to work in demanding environments. Laser trackers measure distances and coordinates to a very high degree of accuracy and precision. As a single surface invariant reflector, the BMRs provide great accuracy, together with a constant optical path difference. This is especially important because they allow accurate distance measurement without the need to account for refraction, a common problem when using solid prism type Retroreflectors. The PLX Ball Mounted Hollow Retroreflectors are manufactured in three different diameters: 1 1/2", 7/8" and 1/2", and are available in two centering accuracies, .0005" and .0001". The new DBMRs (Durable Ball Mounted Retroreflectors) are available in 1.5” diameter and two centering options (0.0001” and 0.0005”), all are guaranteed to be compatible with all manufacturers’ laser tracking systems.